My first encounter with garlic scape was a few years ago at a farmer’s market near my house in London. I did not know what they were but I was drawn to their vivid green colour, their slender shape and whimsical curl. Bite into raw scape and you will find it crunchy like a green been but with a muted and mild garlicky flavour. Trim the top and the ends before chopping it and sprinkling a tablespoon or two over salads. Purée it and add it marinades. I like to grill mine and serve them with roasted asparagus spears. 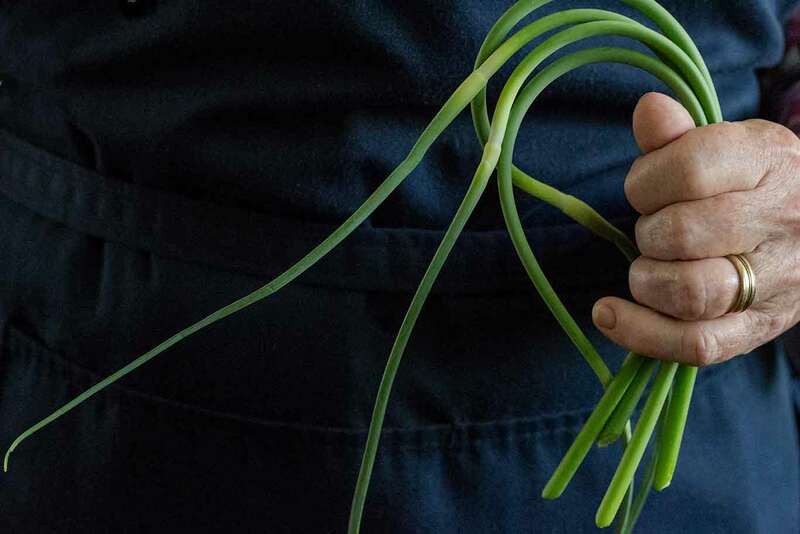 Scapes are the perfect complement to frittatas, omelets and eggs of all sort. When my friend Julie came in this morning with a bunch of freshly picked scapes from her garden, I quickly blitzed them into purée. I intentionally omitted grated cheese because I wanted to dollop a tablespoon or two over grilled fish. I plan to make green rice with the rest. Trim the hard end and dry tips of the scapes and chop them roughly. Blitz them together with the rest of the greens in a food processor and while the motor is running pour olive oil in a slow stream. Place the pistachios on a kitchen towel fold it over and break them coarsley with a mallet or a rolling pin. Incorporate the pistachios with the pesto and season with salt. The purée will keep refrigerated in an airtight container for one week. This looks delicious and I’m going to try it. However, would you please consider in the future to discourage people from using plastic (as in the plastic bag smashing of nuts)? 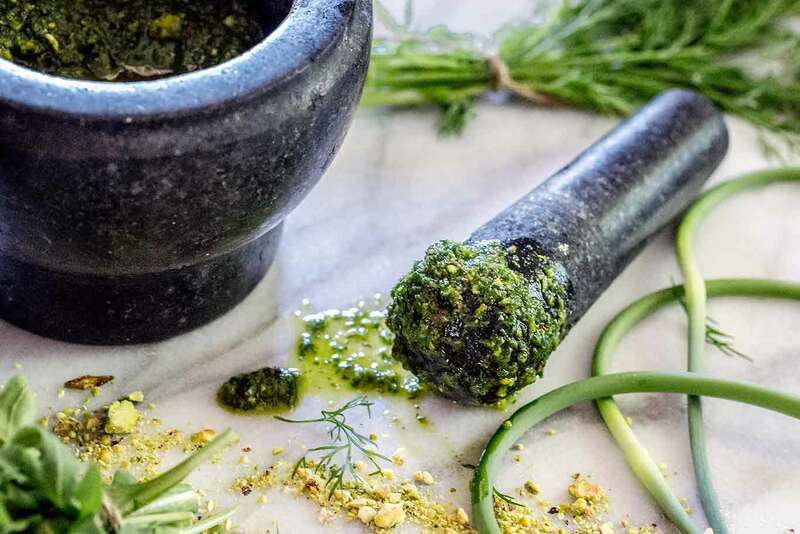 Your mortar and pestle make a lovely image as well as being effective; and there are other ways to achieve the same textured, crushed nuts without using a plastic bag. Even a kitchen towel and a rolling pin would do. You are so right about not using plastic. Thank you for the reminder.